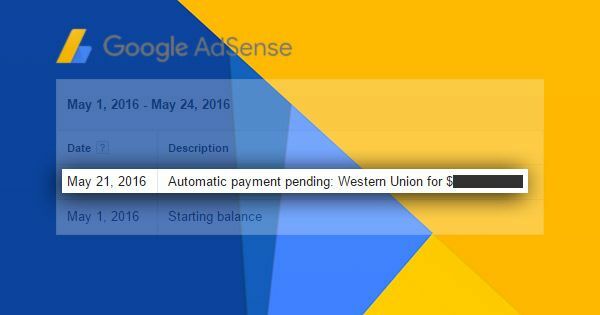 On the 21st of May 2016, many Google AdSense publishers saw this notification on the dashboard: "Automatic payment pending: Western Union." It used to be "Automatic payment in progress." It appears that Google AdSense changed the wording, but publishers from the Philippines, Indonesia, China, Vietnam, Cambodia and Pakistan who encountered it were more concerned on why payment has been delayed for almost five days already. They said the notification should have turned blue by now, which means there's a link to a receipt showing the Western Union Money Transfer Control Number (MTCN) and other payment details needed to claim proceeds of the supposedly "quick" money transfer. Some publishers expressed dismay over the Google AdSense payment delay saying they badly need money to settle debts, pay their monthly bills, and buy food for the family. Others simply said they are annoyed. Read more of these complaints on the AdSense Help Forum. Google AdSense gave no word about the problem but there were speculations that a reported raid at Google's Paris headquarters on Tuesday, which was conducted by French investigators as part of a probe over tax payments, may have something to do with the delay. A few publishers were skeptical though as payments for those in the above-mentioned countries are processed by Google Asia Pacific Pte. Ltd. in Singapore, unlike before that funds pass through Ireland. According to the Google AdSense payment timelines, "Western Union Quick Cash payments are sent on the 21st of the month and will be available for pick up at any Western Union location in your country one business day after they're issued." This year, May 21st falls on a Saturday so it's possible that payments can be claimed a few days after the weekend. UPDATE: In the Philippines, Google AdSense payment was finally issued around 6:30 p.m. today.